It took the threat of nuclear war, but we’ve finally got a legitimate source of uncertainty in the markets finally. Just a couple of weeks ago, most traders and investors were screaming “BUY, BUY, BUY!” at every turn. In last week’s watchlist, I urged caution saying that investors should view the current economic environment objectively and avoid chasing the returns of hot stocks or sectors. With an escalation in threats between the U.S. and North Korea, I’ve noticed some investors starting to panic and talk about moving everything to cash or gold or (gasp!) bitcoin. Just like piling into stocks at peak enthusiasm, selling all (or even a good chunk) of your risky assets at the first sign of trouble can produce equally damaging results. If anything, an event such as this should be used to help you assess your true risk tolerance. If you’re a little jumpy at the first sign of trouble, a stock-heavy portfolio might not necessarily be for you. Minor tweaks to your portfolio are reasonable, but swinging from 100% stocks to 100% cash might be an overreaction. Still, if you want to stay in equities but go about it in a risk-managed way, there are ways to do that. Normally, each week’s watchlist includes ETFs that I think could move in the upcoming week based on economic news, earnings or some other event. This week’s edition is going to look a little different. I’m going to highlight four funds that you can use to help manage overall portfolio volatility. If you’re worried about current world events and how they could impact the financial markets and your money, this week’s watchlist is for you! Gold (and to a lesser extent, silver and other precious metals) has always been viewed as the traditional hedge to equities. During uncertain times, people flock to safe places. Precious metals are viewed as an asset class that will always have value regardless of what happens economically or politically. While gold isn’t guaranteed to rise when the market drops, it has a pretty good track record during longer bear markets. In many cases, the price of gold went up, but before piling in, remember that gold is a volatile asset and, like any other asset, is prone to long periods of underperformance. 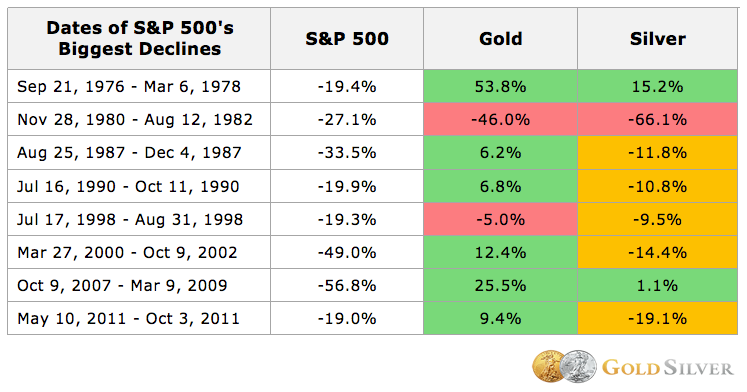 Using historical standard deviation of returns, gold is around 60% more volatile than the S&P 500. Government-issued Treasury securities are the other typical safe haven. During any type of sharp or prolonged downturn in equities, we often hear the term “flight to quality” as investors move out of stocks and into government bonds. Treasuries performed well during both the popping of the dot-com bubble and the financial crisis, two instances where investors were most looking for protection. Remember that long-term bonds can be a bit volatile in and of themselves. If you’re looking for something more conservative, swap out the 20+ year Treasuries for the iShares 3-7 Year Treasury Bond ETF (IEI) or something even shorter term. This fund won’t be a perfect volatility hedge but it will help take some of the aggressive tilt off of your portfolio. And you’ll get a nice dividend yield to boot! This ETF takes the 75 highest yielders from the S&P 500 and then identifies the 50 names from that subset that have historically demonstrated the lowest volatility. As you’d imagine, the portfolio features high allocations to traditionally defensive sectors such as consumer staples and utilities. Now, this fund still has an 87% correlation to the S&P 500 so you should still expect downside in a bear market, but hopefully just not as much. This is more of a “current situation” hedge. Defense stocks jumped as the threat of military escalation rose this past week. That’s not an unusual reaction for such a situation but it usually tends to be a short-term response. On the other hand, aerospace and defense stocks have significantly outperformed the S&P 500 over the past several years. As the U.S.-North Korea situation evolves, these companies could continue to benefit.